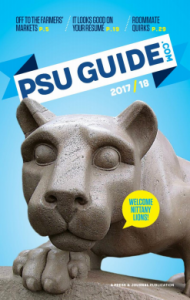 For the past seven years, the Press And Journal (Middletown) has been producing its PSU Guide as a way to introduce Penn State University students, as well as faculty and staff, to businesses in the greater Middletown and Central Pennsylvania areas. The publication allows area advertisers the opportunity to reach a demographic to which they may not normally connect. Copies of the publication are distributed to incoming freshman students during orientation and are also placed in every apartment on campus, as well as in all off-campus housing. Several hundred copies of the Guide are also handed out during an annual community event held the first week of classes. The Guide’s content is generated by Press And Journal staff and features local information of all kinds – recreation, shopping, entertainment, and services. The goal is to provide new and returning students with a valuable resource guide that covers everything from health information and car repair/servicing to the best walking and hiking trails in Central PA, that they can use throughout the year. For more information, contact Julianna Sukle.